On Monday 20th March 2017, we were Music Subject audited by the County Music Hub. 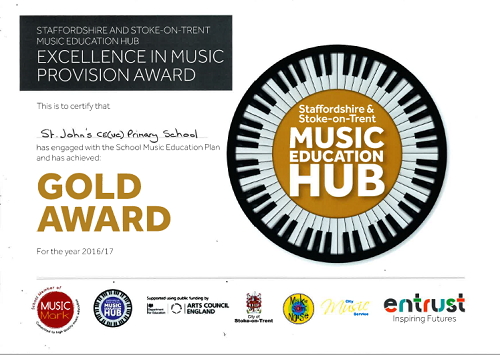 After closely examining all of our evidence, and assessing our school's commitment to Music, we were awarded the Excellence in Music Provision GOLD Award. This is testament to the extremely hard work and commitment of all of our pupils, staff, school leaders and governors. There is a genuine love and celebration of music at St John's which is something we should be very proud of. Long may it continue. Well done everyone! In August 2018, the school was awarded the Gold School Games Mark for our commitment to competition, school sport and physical education. 75% of our KS2 children experienced inter-school competitive sport during the 2017/2018 academic year. During 2018/2019, we intend to provide further opportunities for our Y6 Sports Leaders to develop and lead sporting competition within our school. Our Sports Leaders will form the core of our School Sports Council- a selection of children from KS2 deemed to be role models in P.E. who will be able to assist with the delivery of competitions and motivate their peers to succeed. We are very proud of all of our children and those who represent St John's do so with an abundance of effort, determination and skill. The St. John's staff, pupils and governors have worked together to develop the profile of Online safety within the school and have began to work towards achieving the 360 Degree Online Safety mark. As recognition for our efforts we have been awarded the Certificate of Progress to Safety Online. Staff and pupil's discuss Online safety during every Computing lesson and as a school we endeavour to promote a safe, sensible and secure approach to using the internet and any online devices. We will continue to develop our approach to Online Safety in order to meet Curriculum requirements but also to help pupils to take a positive approach to the online world as they grow up.